It has been brought to my attention that many of my blog posts are very long and may have too many photos - so tonight here is a short and sweet post with a new file for you! 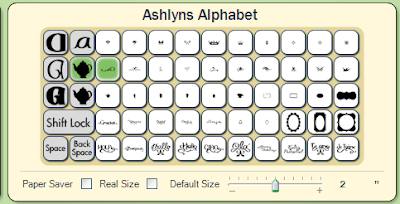 I used two elements from the Ashlyn's Alphabet cartridge to make this frame. 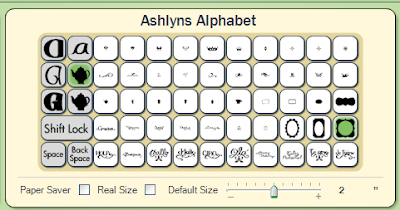 Here is a screen shot of the keypad showing the location of scroll. This screen shot shows the location of the frame (I stretched it in Design Studio to make it more rectangular). 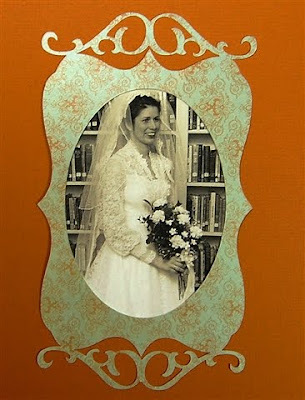 I used cardstock from the Luxury Stack by DCWV for this test cut. 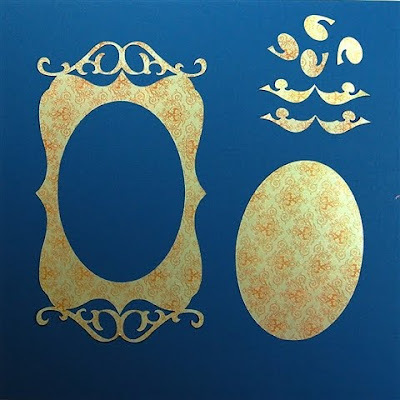 There are some interesting offcuts - the oval can certainly be used for another project and even the small pieces would make embellishments for a card - I think the lower ones look a bit like baby angels with trumpets. The frame is about 5 inches wide and 9 inches high. The oval is sized to work with a vertical (or horizontal) 4 x 6 photo. Never too long, I love your posts. Thanks again for sharing! I enjoy your blogs...don't change anything! I never find them too long. Please continue to inform and educate us. Diane....hmmmm....in MHO your blog postings are interesting, educational, and enlightning! I love your blog the way it is! Please continue as you have. I enjoy all your postings. Have a great day and wonderful weekend! Your posts are too long with too many photos? HA! I say its YOUR blog, you can post what YOU want to! I for one, think your blog is great! Thanks for sharing! Love your blog...please don't change a thing! I love the details and many photos in your posts. I appreciate the time it takes to put each one together but would hate to see you change a thing. Many of us have learned so much from your creativity and great ideas. Thanks for all you do!! No, your post are not too long and not too many photos. Love what you are doing so keep up the excellent work. i think that it depends on the individual person whether the post maybe too long. if you are a total novice, there are perfect. sometimes i skip thru more due to time rather than too much info. with all the freebies you provide your followers, i feel that if you are very detailed about a project that i will usually read thru it just to ensure i didn't miss something important. tx again for all the great projects and ideas you provide us. It's your blog! Please keep it the same. It has really helped me! Gosh, it's your blog, you should do what you want! People who don't want to read can log off and go somewhere else. I love your postings.... Including this one. I think the person who said they were too long needs punching in the face... And to understand that reading IS a primary skill!!! PS - Go take a guess on my little blog award. Hint... my numbers are not even close to yours!!! I personally don't think that your posts are too long! I love your posts and the pictures. Specially since I'm a visual person! Thanks agai for all you do! I love your posts just the way you make them - with lots of detail. Please don't change them. They are always great. Thanks for all you do. I look forward to checking your blog daily! Diane - please, please, please don't listen to insensitive people...your blog is just that, your blog!! We have the choice to subscribe to your blog or not...we subscribe because we love your talents and appreciate your gift that you share with us...we have the choice to subscribe or not and we have the choice to not read what is not of interest to us (but I can't think of anything I am not personnally interested in!!). If you did not give us details, we could not learn. Don't change a thing and know that your talents are very much appreciated!!! Thank for all that you share!!!!! I happen to love the blog and do not feel the posts are to long at all. They have helped me a great deal with my cricut and I find them inspiring. I also love how you give some backround or personal information with your posts it is really nice touch! Plese do not change or feel the need to shorten them. You are who you are and should not have to change that to make another happy! I love your blog & I am glad that you give step by step instructions. All your projects are easy to follow. Thanks for all you do. I love your blog, if you are comfortable with the length of your posts, who cares what anyone else thinks? Thank you for all your informative posts and photos. I've learned a lot from your blog! I love everything about your blog and I yet to see a blog post that was too long or had too many pictures and I havv beeen reading it for a long time! So please do now change a thing!! Absolutely not! Your blog is perfect! The daily emails inspire me to think crafty! I greatly appreciate the time and effort you put into your blog. I love all the pictures and personality you add. Don't let anyone rain on your parade...they're probably just envious.